People have been decorating eggs for thousands of years. In various cultures, decorated eggs were given to newlyweds as a symbol of fertility, wishing the couple many healthy children; in some countries, an egg was buried in the field when a new crop was planted. 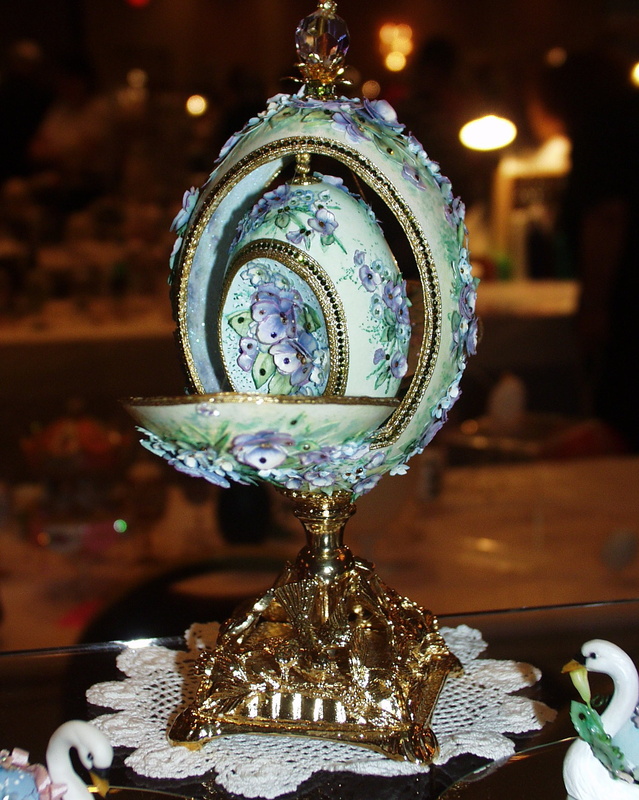 Catherine the Great of Russia carried a jeweled enameled egg that doubled as a sewing kit when she traveled. The most famous decorated eggs are the Imperial Eggs of Russia, commissioned by Tsars Alexander III and his son Nikolas II, and created by Peter Carl Faberge. These eggs were crafted from silver, gold, and platinum, and were then enameled and encrusted with jewels. Every egg opened and contained a secret surprise inside – perhaps a ruby pendant, or a miniature train that actually runs on tiny tracks. After seeing these beautiful creations, Russian royals and elites wanted special eggs for themselves, and the “House of Faberge” was born. The few remaining Imperial Eggs are currently in private collections, and when they do become available for sale are priced in the multi-million dollar range. More affordable are the decorated eggs made from actual eggshells and embellished with colorful crystals, gold leaf, faux pearls, and fanciful filigree cutting.